Artur Tuznik is an award-winning Polish piano player and composer based in Copenhagen, Denmark, active on European scene for jazz and improvised music both as a bandleader and sideman. His recognizable musical voice is strongly influenced by language of impressionism and folk music of his origins, while rooted in tradition of modal-jazz and sound we know as Scandinavian jazz. In various projects, he has shared the stage and/or recorded with artists like Tomasz Stanko, Jeremy Pelt, Tony Malaby, Anders Christensen, Carsten Dahl, Andreas Lang, Richard Andersson, Anders Mogensen, Thomas Agergaard, Tomasz Dabrowski and many more. Artur has been performing on festivals in Europe, USA, Canada and such prestigeous venues as Lincoln Center in NYC. Sometimes things need their time to mature and this has been almost 1,5 year ago, but I’m very happy to share it with You for the first time. Song called PANDI, that came up as a result of my co-operation with my good friend and amazing artist MOO LATTE. Recorded and filmed in November 2017 at the Rhythmic Music Conservatorium in Copenhagen. Vinterjazz festival - 5 performances starting tomorrow! Hope to see you there! So it looks like it’s been 10 years since I moved to Denmark. Another year passed and I’m happy to be starting the new one here in Copenhagen! In 2018, surrounded by fantastic people and good music, I’ve been lucky to experience art in so many contexts and dimensions. Some new cooperations happened and I’ve also been fortunate to learn myself better artistically as a composer, performer and educator. 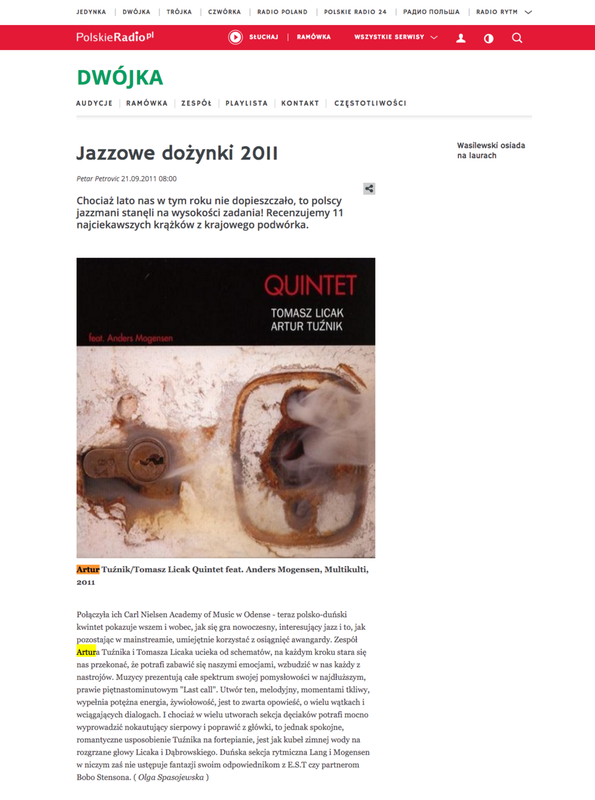 At Copenhagen Jazzfestival I presented new music written during the spring for 9 pieces band incl. Atom String Quartet, Irek Wojtczak, Cezariusz Gadzina, Joel Illerhag and Simon Albertsen, as well as new tunes for trio and quintet. Earlier, my composition "Woods" was rewarded by DPA, premiered with the new arrangement by DR Big Band and broadcasted live. Through couple of last years I’ve been realising the importance of composing and its role in the proces of self-expression in the way only natural to ourselves. Long post, click —> HERE <— to read more about my 2018! 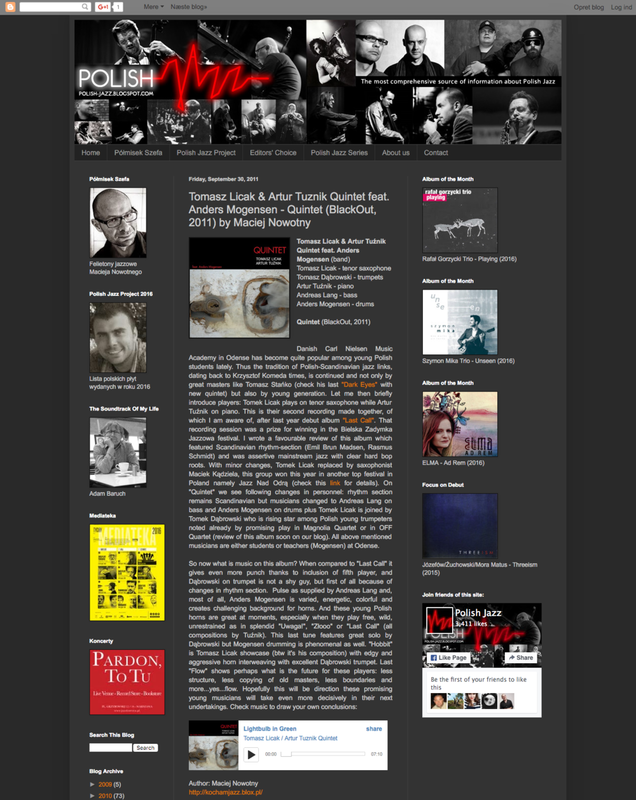 Late review from Copenhagen Jazzfestival in Japanese music magazine CD Journal! "Another climax in this project, Swan Østerbro, is the chamber jazz ensemble led by Artur Tuźnik that includes Atom String Quartet, one of the busiest group in the music scene today in Poland, Danish rhythm section Joel Illerhag and Simon Olderskog Albertsen, and two veteran Polish saxophonists Cezariusz Gadzina and Irek Wojtczak. I was moved very much by the music of that ensemble inspired deeply by contemporary classical music"
Premiere of my 9 piece band "SWAN Ensemble" have received 5 stars (5/6) from the biggest Danish daily newspaper POLITIKEN. During the concert at Copenhagen Jazz Festival 2018 the band under my direction has been playing my music written especially for this occasion! I've been fortunate to be able to feature fantastic ATOM STRING QUARTET as well as saxophonists Irek Wojtczak and Cezariusz Gadzina, as well as fantastic rhythm section of Joel Illerhag and Simon Albertsen. July 13th - Just finished writing music for a 9-piece-band feat. Poland's outstanding ATOM STRING QUARTET! Make sure to go and hear the premiere of this new amazing project at Skt. Augustinus Church! July 15th - Brand new band with musicians from Norway, Sweden & Iceland! All of them known for their unique voice, will be playing my music at Christiania Jazz Club, late evening 11 p.m. on the last day of the festival! Plus - my trio with new music at JazzCup, Agergaard/Tuznik/Ginman/Blachman at the great Bellevue Theatre. And a duet with Thomas Agergaard at Skt. Augustinus Church! Hope to see you there! Already on thursday I'm going on tour with some of Denmark's finest musicians, who has been defining Danish jazz-scene for the last 3 decades! Great honor to be a part of this special project and definitely looking forward to make some good music! Artur Tuznik TRIO has been included in TOP 5 jazzalbums of 2017 recorded by artists from Denmark! That is according to the biggest Danish national newspaper POLITIKEN. Very proud of that distinction, especially as the company is pretty heavy! I've been honoured to receive a 3rd prize at "Young jazz composer of the year" 2018! My composition "Woods" has been arranged by Nicolaj Bøgelund and performed by Danish Radio BigBand and broadcasted live on Danish national radio P8. adventurous contemplation in his playing"
''(...) Possibly the most interesting piano-achievement on the Polish jazz scene last year"
"Well balanced and simply worth listening to"
"His compositions and the ambience of this album is simply just a beautiful thing"
"One of the most interesting albums of young Polish jazz - perfectly played and corresponding in a beautiful way with what we, in today's jazz, call a creative, original concept. The new album Artur Tuznik TRIO features prominent individualities with established position on the European scene for jazz and improvised music. Together with Davidsen and Høyer, Tuznik introduces a darker sound inspired by impressionism, Scandinavian avant-garde and Slavic folk music. Minimalistic compositions, often with open forms, highlight strong melodic sense and rich harmonic language of the leader. With original music, virtuosity, experience and unique voice of all three personalities, Tuznik presents a great band capable of merging intense energy, spontaneous improvisations with lyrical, almost meditative ballads. Mixed by Jakob Høyer. Mastered by Teis Frandsen. November 2009 by Jan & Mateusz Smoczynski. Mixed and mastered at RecArt, September 2010 by Lukasz Kurzawski. mixed and mastered by Eryk Kozlowski Red eR Studio.